Hide the dishes. I hate leaving dirty dishes in the sink. If I don't have time to clean them right away I toss them into a plastic tub then tuck them into the cabinet under the sink. I may even fill the tub partially with water if there are dishes that need to be soaked. If you don't have room under your sink find a decorative basket that will fit on top of your fridge and hide a plastic tub inside. You can also hide dirty dishes in the dishwasher however, this is a great alternative if your dishwasher is already full. Keep an empty basket handy. Counter tops tend to be a dumping ground for many things. If you have company coming over toss everything into the basket. I store mine on the top shelf of my pantry but you can also tuck it into a cabinet or store it in another room. Be sure to empty the basket after your company leaves or as soon as you have time. Clean your garbage disposal. Fill an ice cube tray with vinegar and a slice of lemon peel. Keep these handy in your freezer at all times. Before company comes over toss a few vinagar and lemon ice cubes into the disposal with a full jug of water. The vinegare and lemon will get rid of any smell and the water will help wash any remaining food down the drain. Cover up the stink. Between last nights dinner, the garbage can and garbage disposal, kitchen tend get pretty stinky. Before your company arrives, be sure to take out any trash. Fill a pot with water then toss in some orange peels and cinnamon. Bring the pot to a boil and then let it simmer until your company arrives. Keep cleaning supplies handy. I keep a small basket with a few rags and all pourpose cleaner in my kitchen. I used to keep it under the sink. However, I got tired of reaching into the cabinet 100 times a day. Now I keep the basket on top of the counter throughout the day. This allows the kids to easily clean up their own messes and helps me stay on top of cleaning throughout the day. The basket gets tucked back under the cabinet when we have company and every evening after dinner. Having everything contained in a basket keeps rags and cleaners from cluttering the counters, and also allows for quick clean up when company arrives. Spot treat the floor. Using a damp rag take a quick look at your floor and clean up any spots that are highly visible. I usually start off by only cleaning the large spots. Once the rest of the kitchen looks clean and my company has not arrived yet, I will go back and clean up the smaller spots. Hide the stains. Take a quick look at your kitchen towels. If there are any stains then fold the towels so that the stains are not visible. Great ideas... the kitchen and bath are my 2 biggest problem areas! Hate that it always looks cluttered so I love your ideas of using the large baskets! Love it! your blog is great. I just started a blog about a week ago so I am just getting started. http://inspiretoorganize.blogspot.com/. A quick counter cleaning with Bleach Water (equal parts bleach and water) clean coffee rings, drips, drops, and other random spots off counters super quick. Especially if those counters are white! 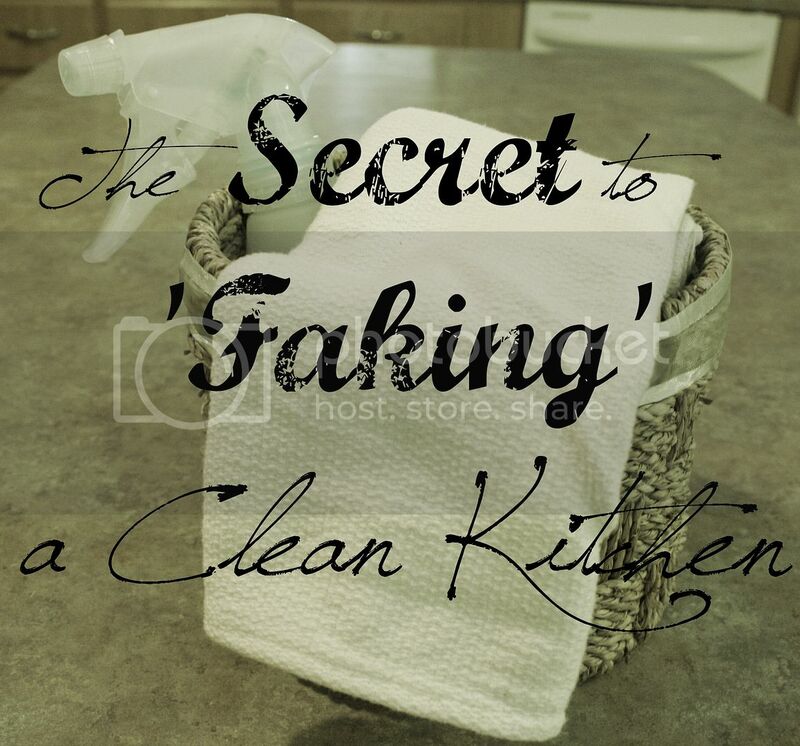 It also leaves your kitchen with an unmistakably clean smell. Pour 2 TBS vanilla extract into a regular coffee mug. Put the coffee mug into your oven at its lowest temperature setting for 30 min to 1 hour. It will smell like you've been baking all day! If all else fails...as soon as your company shows up say something like, "Oh my gosh I was just in the middle of cleaning /washing dishes!" Reserve one side of sofa cushions to be shown to guests. Before company arrives, flip over the cushions to reveal good-as-new fabric. When guests are gone, flip them back. Rid the sofa of pet hair by wetting the fingertips of rubber gloves and gliding your hand over the sofa. The hair will stick to the rubber. You can also hide dirty dishes, clothes, etc in your oven just be careful that you don't forget. Nice tips Jamie. I will definitely use your techniques. So basically your clean and green tip is to have a secret storage system that you can use to just dump everything inside until later. I think that requires a lot of discipline really. I think if it was me, if I already left something there, I would not look at it probably after a week or two later. That is how my laundry pile in the room looks like now. Hence, your ideas are great but only for those who follow rules.